It is April 9 and snow and cold still prevail over the garden. The April sun has transformed the four season greenhouses despite the cold. Spinach, lettuce, arugula, mustard and mizuna are starting to be cut and sold. We are really hoping to start using the great outdoors for hardening off seedlings for early spring plantings. Approximately 87 varieties of tomatoes await in Ms. Davis’ science room windows ready for transplanting ! Troy Howard Middle School students are displaying the Garden Pets they created in Mrs. Sproch’s seventh grade art class. 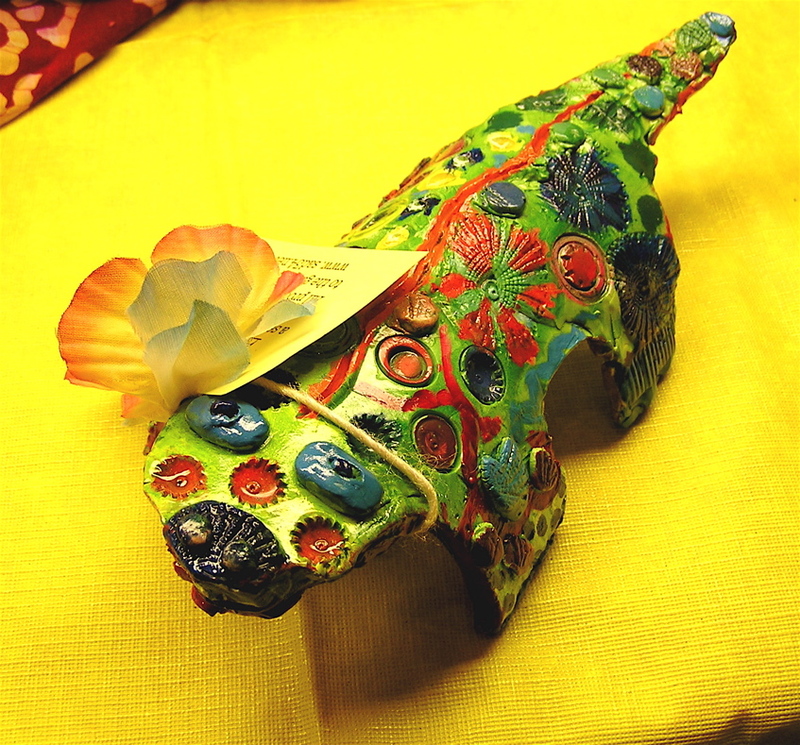 These are hand built and painted ceramic sculptures preserved with Acrylic and polyuretnane. 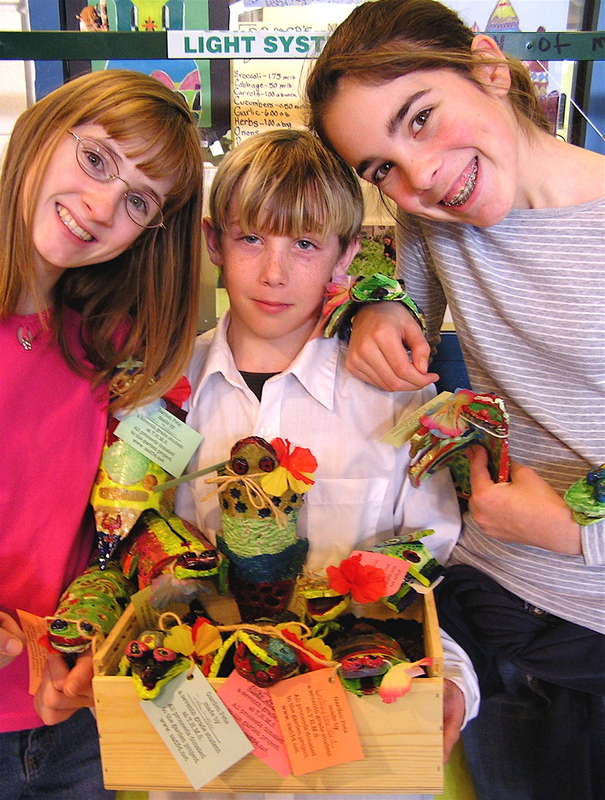 Seventh grade students donated their precious pieces to help continue funding of their award winning Garden Project. The students have put lots of extra time and energy into the Garden Project to make it financially self-sufficient to help with SAD 34 budget challenges. A travel through time…I am a Junior at Unity College majoring in Landscape Horticulture and interning at the Troy Howard Middle School (THMS). The first day I walked into the classroom I stepped back 10 years to when I was in my middle school in Virginia. How I wish I could have had the experiences that these students are having here in Belfast Maine. The willingness that they have to work with the vegetables and greens all year long is a thrill to experience. When I leave THMS to head back for my classes at Unity, I am filled with energy that was transferred to me from my day at the middle school. Their enthusiasm is contagious. During this semester I have been helping Jon Thurston in the Green house and Steve Tanguay in the classroom. I have been mentoring students and helping them design final projects. I have observed that by mixing the “normal” classes such as English, social studies, math, and science with a real world experience like designing and managing a hoop house with no artificial heat through a Maine winter. In my opinion, this approach to learning helps the students to remember the subjects they are taught. The 7th Grade north class uses hands-on-learning to make each lesson concrete and enduring. I am delighted to take part in such an extraordinary and effective approach to learning. The students have started over 70 varieties of tomatoes, both heirloom and hybrid, for seed saving and cooking during the next fall season. 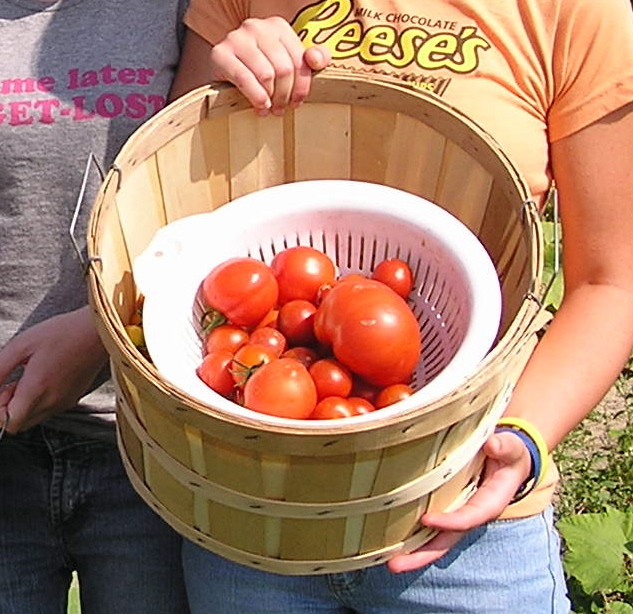 The Garden Project works to supports Seed Savers Exchange and Medomak Valley High School in their efforts to locate and save open pollinated seed to help preserve our history and protect biodiversity. We are particularly interested in plants that have been grown locally over many generations and welcome any leads that may help us in preserving seeds grown locally. Class visits to the greenhouse have started up again which is a good sign of spring. This week, the fifth graders from Mrs. Cox’s science class at the Drinkwater School came to work with some of the Seventh grade soil experts yesterday. The lesson was learning all about soils and what’s most important in keeping your soils healthy. 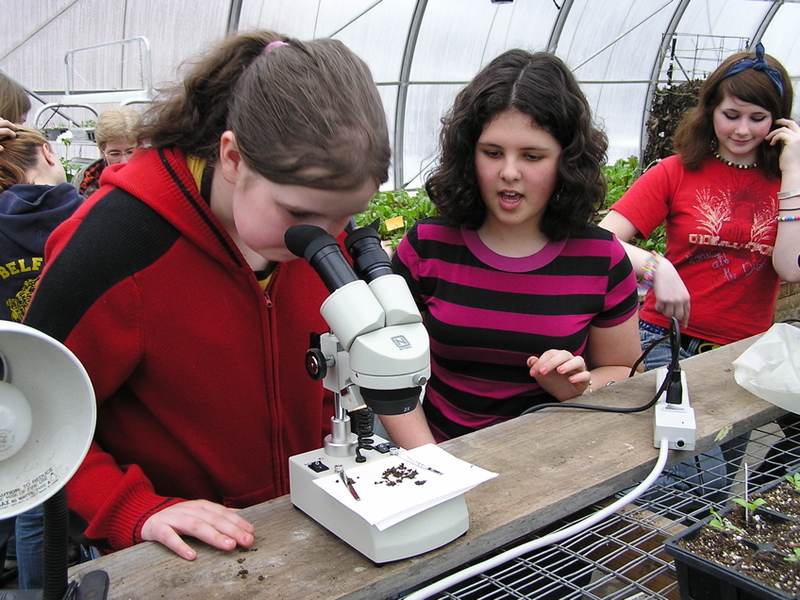 Students studied soils and worm castings under the dissecting microscopes in the greenhouse. The students took a worm castings experiment back to their classroom where they will compare the growth of the sunflower seeds they planted both with and without the addition of worm castings (20 percent). The seventh grade students really enjoyed working with their younger peers and are already planning for their next visit. Jon, Linda and I (Steve, the classroom teacher) presented at the 2nd Annual Local & Sustainable Foods Conference at the Unity Performing Arts Center this past weekend, our second outing in five days. The conference had dozens of sessions on everything from homesteading healthier food in schools and buying locally to keep your dollars in your community and the importance of preserving biodiversity with the Rodale Institute. We had a great crowd for our talk in the Arts Center and were pleased to hear about how many schools and programs our own project has touched. Of course, the most fun is talking about our students and all the wonderful things they have accomplished. The reactions we get to the knowledge base our middle schoolers are building is quite remarkable. You tend to forget how special the kids work is when you are all so engaged in what you are doing. “Mainer’s import 80% of their daily calories, much of it coming from industrial farms in China, California, and Mexico. Keeping food local gives us greater say in what we eat and how our food is produced, and it improves our food security”, says Bob St. Peter, Forest Farm. Great beginner advice here for growing from seed .